The war between Israel and Hamas has left both sides accused of committing war crimes as Gaza lies shattered. In less than two months a reported 17,000 homes were destroyed while tens of thousands have been left destitute and without a place to live. On top of this, Israel is confiscating around 1,000 acres of Palestinian land near Bethlehem. Human rights expert Professor William Schabas is chairman of a U.N. inquiry in to the conflict. He's received criticism in this role and the Commission of the Inquiry he is leading has been labelled a 'Kangaroo court' by the spokesperson for the Israeli foreign minister. Schabas seemed optimistic about the prospect of speaking with unenthusiastic officials. "They can't prevent us doing an inquiry by refusing to give us access." "I'm hopeful that we're going to convince Israel to cooperate with the inquiry. You know, five or six years ago, there was a controversial inquiry that was presided over by Richard Goldstone." "He later said that if he had known things when the report was being prepared that he later learned, the report would have been different. I think that's a powerful lesson for Israel about the interest it has in actually coming forward and cooperating with the inquiry." After the cataclysmic conflict between Israel and Gaza-based militants, some hope came today with an Egypt-brokered peace deal. Christiane Amanpour asked the British Ambassador to the United Nations Mark Lyall Grant if he was hopeful. "This is very good news, but we've seen truces before." he told her, "Just a ceasefire, if it gets back to the status quo, is not going to provide a long-term solution to the crisis." "We need something that is: A) sustainable, and B) acts as a bridge to serious status negotiations between the Palestinian Authority and Israel." "We have to move on from this cyclical crisis to something that is more sustainable." A tense stand-off in Ukraine, the biggest Ebola outbreak in history, devastation in Gaza - and all the while, ISIS grows in strength in the heart of the Middle East and racial tensions come to a head in the United States. A fractured world and United Nations Secretary-General Ban Ki-moon is the man tasked with picking up the pieces. "The world is confronting multiple crises at this time," Ban Ki-moon told Christiane Amanpour. "The situation in Iraq, we have a very serious crisis in Ukraine but we still have very serious crises in Libya, South Sudan, Central African Republic. On top of this we are now being hit by Ebola epidemics." Amanpour first asked him about the increasing threat of ISIS: an extremist militant group whose seized territory across Iraq and Syria has been said to be larger than the United Kingdom. Can the U.N. help those affected and to stop the threat before it spreads even further? "The United Nations cannot do it alone in addressing international terrorism and extremists. The way they have been terrorizing the international community and its people by kidnapping the women, children and particularly journalists, this is totally unacceptable. These are against the international humanitarian law and against the international human rights law and we saw this horrendous killing of Mr. James Foley, that we have condemned in the strongest possible terms." Amanpour asked if the horrors of ISIS that he had just described were due to an escalation of the Syrian crisis because, as he had told her in a previous interview, there was no "Plan B". "That is why I have always been urging, the number one priority should be that that the parties stop the violence unconditionally and return to political dialogue." (CNN) - Did Yasser Arafat die eight years ago of natural causes or was the 75-year-old Palestinian leader poisoned, as his widow believes? That's the question forensic investigators from at least three nations are trying to answer by testing samples taken from Arafat's body, which was exhumed Tuesday and reburied a short time later. Tests are being performed on those samples for the presence of polonium - a toxic, radioactive element found on some of his personal belongings earlier this year. For five decades, Arafat was the most prominent face of Palestinian opposition to Israel, first as the head of the Palestine Liberation Organization, which carried out attacks against Israeli targets, and later as the head of the Palestinian Authority. What's next for Palestinian territories? History professor Rashid Khalidi discusses the future of the Palestinian territories and how the latest conflict may shift political power. A conversation about the bigger picture between Israel and Gaza, and the changing roles of Egypt and the United States in the region. 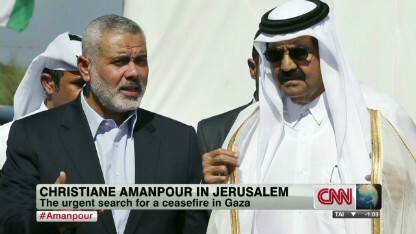 PART 1: Qatar's Prime Minister tells CNN's Christiane Amanpour about his country's role in ceasefire talks. 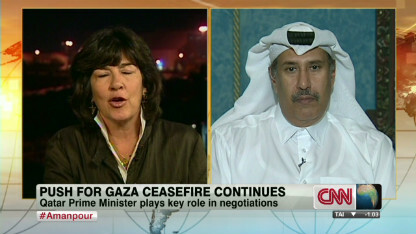 PART 2: Qatar's Prime Minister tells CNN's Christiane Amanpour about his country's role in ceasefire talks. 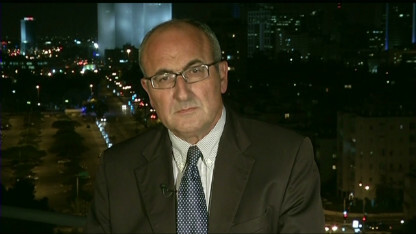 Israeli Knesset Member Daniel Ben-Simone says the the Americans are urgently needed to quell the escalating violence. Analyst Daniel Levy looks at the long term situation between Israel and the Palestinians. The United States must take action to quell the escalating violence in the Middle East, Israeli Knesset Member Daniel Ben-Simon said Friday. “It’s time for the White House to call and to look at what’s happening here,” Ben-Simon of the Israeli Labor Party told CNN’s Hala Gorani. Even though the United States has publicly given verbal support to Israel and blames the escalation of violence on Hamas firing of rockets into Israel, Ben-Simon senses an absence from the White House in that region. 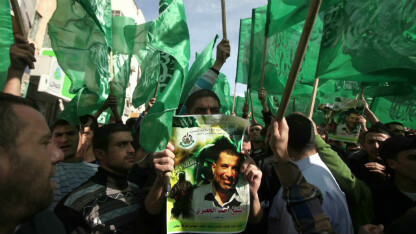 He fears a regional war beyond Gaza, if newly re-elected President Barack Obama does not step in. “Benjamin Netanyahu has been prime minister for seven years. This is his first war. I cannot predict how far he will go. What I can tell you because is its becoming a serious crisis because Tel Aviv has been hit… I can’t tell you how serious it’s becoming.” He emphasized support from the U.N. and Europe is not enough, without, “the boss” as he referred to the U.S., stepping in. Meanwhile, after returning to Egypt from his trip to Gaza Thursday, the Chief of the Egyptian Presidential Cabinet called for an end to the violence. Al-Tahtawi accompanied Prime Minister Hesham Kandil to Gaza Friday, a trip critics saw as an opportunity for press exposure. Al-Tahtawi discounted that, saying that saying Egypt is willing to give Gaza tangible support; but said they are not prepared for any type of military action. For CNN's complete coverage of the violence in Israel and Gaza click here. Israel's Deputy Prime Minister, Dan Meridor, discusses the strikes on Gaza with CNN's Hola Gorani. 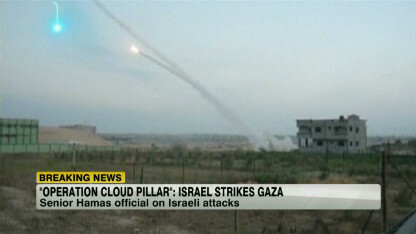 Osama Hamdan, a senior member of Hamas, speaks to CNN's Hala Gorani about the strikes in Gaza. For complete coverage and the latest updates on the airstrikes in Gaza click here. Israel is leaving “all options on the table,” including a ground offensive into Gaza, Israeli Deputy Prime Minister Dan Meridor said Wednesday. 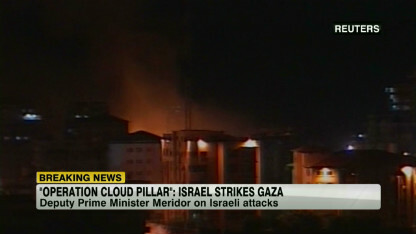 Meridor maintains Israeli strikes against Gaza are in response to rocket fire from Hamas. Meridor also told Gorani that Benjamin Netanyahu, the Israeli Prime Minister, spoke with U.S. Vice President Joe Biden Wednesday, regarding the attacks.